Question to the ‘Fight for 15′ crowd … which is better $9.50 an hour or $0.00? Snarf’s Sub Shop in Chicago has closed it’s doors and fired all of their staff just days before Christmas via email. 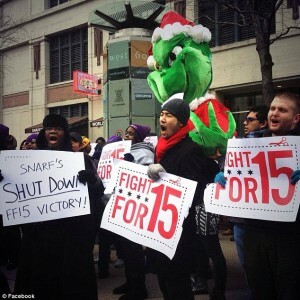 Snarf’s was the target of the SEIU and was closed for four days, from December 5 until December 8, as employees went on striking demanding $15 an hour and better benefits. Now they are all out of work just before the holidays. From the files of, don’t ask for things they might just come true. So hows that strike and forcing your employer to shut down working out for you now? You want to be paid $15/hr to make a sandwich, are you kidding? Wonder how the guy with the FF15 Victory … Snarf’s Shut Down sign feels about now? A Chicago sandwich shop has fired all of its 20 staff over email just two days before Christmas. Staff at Snarf’s Sub Shop in River North received the bad news on Sunday night in a group email notifying them that the drastic action was effective immediately. The company blamed ‘increased competition and losses’ for the firings. Director of operations Doug Besant said in the email the restaurant will likely close for a month as they remodel and reconcept the business into a burger joint. But the move comes less than a month after Snarf’s workers rallied for higher wages. The email, obtained by ChicagoGrid.com, read: ‘Due to increased competition and losses, ownership has decided to consider remodeling and reconcepting the store at 600 West Chicago Ave. The sandwich shop claims that the firings were not a retaliation for their strike. So what if they were? Chicago fast-food, retail workers join in nationwide protest over wages. Honestly, if my business was hanging on by a thread and individuals picketed by business forcing me to shut down for days, they all would have been fired then. Sorry, making sandwiches is not a $15 a hr. job. Hmm, Chicago is a union town eh, so was Detroit, how are they doing these days? Clustered around a giant, bright green “Grinch,” the protesters — part of a “100-city strike wave”— are demanding a $15-an-hour wage and the right to form a union without retaliation. “Chicago is a union town!” they chanted outside Snarf’s Sandwiches, 600 W. Chicago, one of several stops during a planned daylong demonstration in the city. The group was expected to include workers from McDonald’s, Subway, CVS Pharmacy, Sears — among other companies.